Earthy Taurus is a sign that focuses simply on getting things done. Much like its animal symbol, the bull, Taurus is steady, stable and uncomplicated. A full moon in Taurus beckons us to to complete our most pressing tasks, keeping our head low and our nose to the grind until they are complete. With this in mind, I wanted to create a simple, no-nonsense altar to this sign that invoked its biggest traits in a straightforward way. I started with a polished bull horn erected right at the back-center of the altar. This horn is in direct correspondence with the animal symbol of Taurus and, when reflected upon the mirrored surface, presents a completed pair of horns. Much of the altar invokes the protection that Taurus offers as an earthy, grounded sign. In front of the horn, I've placed a golden offering bowl of quartz and bay leaf, both known for their protective properties. I chose gold specifically as Taurus can be known to be a little greedy at times and gold tips its hat at that knowledge. Like the bull horn, I've created horn mimics across the altar. It's particularly noticeable here with the bay leaves and quartz point sticking out of the offering bowl. I chose to charge my grandmother's necklace upon this altar as we near the thinnest point of the veil. I've been increasing my ancestor work and it seemed only fitting. I chose this necklace in particular because it includes the gold flecks along with the green echoed in other parts of the altar. Green, of course, is an earth color that invokes visions of the grass a bull might find itself grazing upon. Golden flowers on either side are surrounded by shards of moss agate. Moss agate is a stone often linked to gardening, an earthy activity often associate with the sign of Taurus. More quartz is placed along the altar in clusters of moss agate shards and larger stones, again encouraging that earthy, protective state of Taurus during this thinning veil season. Lining the back of the altar, I've placed black candles lined with moss agate shards. Black is the color of grounding and protection, perfect for the Taurus sign. You'll notice at this point that the number 5 is being echoed around the altar. Taurus's geomantic number is 5 and thus you'll find this number in the flower and four shards of moss agate, the clusters of stones, the shards around the candles and, as pictured above, the bull horn. You'll also notice that there are five gold flowers and five bay leaves. As often as was possible, I tried to incorporate this aspect. To learn more about geomancy and its association with astrology, click here. Finally, on either side of the altar, I've placed these beautiful green tapers in gold holders for that final burst of earth and wealth. 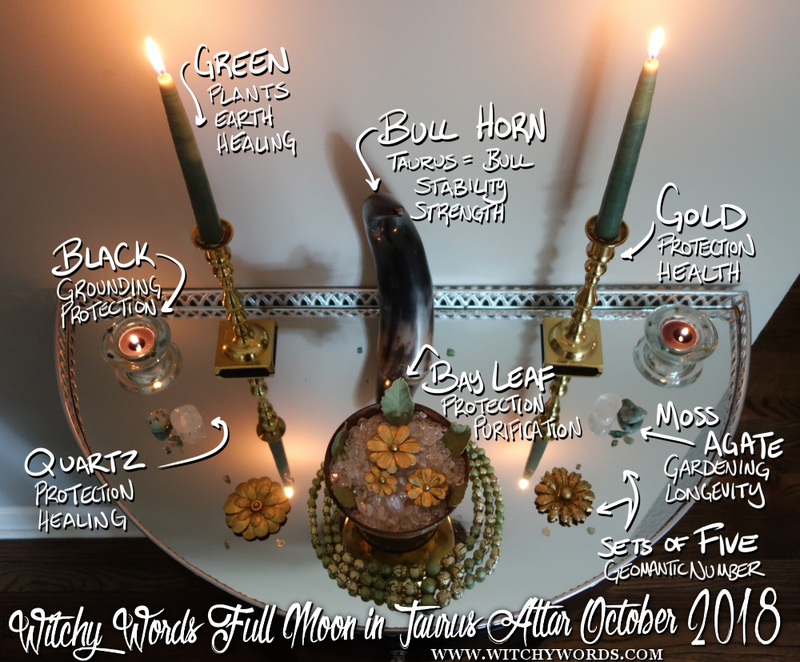 Overall, this altar was a direct and steady nod to the bull sign for this full moon. From the earthy green and stabilizing black to the repetition of the number five, this altar is elegant in its simplicity.